Setting the wrong goals and measuring the wrong metrics wastes time and creates inefficiency you can't afford in today's digital workplace. After all, you are what you measure, so measuring the right things - the things that will move IT and your business forward - is paramount! Klemens Rauch, Development Operations Engineer & Team Leader of IT Development, Brennercom. Klemens Rauch talks about Brennercom's search for a single ITSM solution, rather than a silo of systems in each department, that could be implemented quickly and easily, without the need for development, using their current resources. Cherwell's software has enabled greater automation and far easier reporting. Richard Burton, Technology Director, Utilize. Technology Director, Richard Burton, reveals the shortfalls in Utilize's old ITSM package and the transformation, growth and efficiencies within the business that Cherwell's software has enabled. IMT Service Management Officer for LSE, Nicos Kyriacou, tells of the extensive improvements in automation since implementing Cherwell. Service Desk staff in particular, are now able to step away from the mundane tasks and focus elsewhere, increasing productivity. Internal technology service providers are facing a period of major change and transition as they look for ways to support growing business demands coming from digital transformation, address technical debt, and find answers to the trend of increased use of shadow IT. These driving forces, as well as many others, are putting internal IT functions under intense pressure to rapidly transform their processes, culture, and technology platforms from a silo-based technology operating model to a shared services approach. This approach lowers variability, complexity, and risk to achieve greater scalability and improved cost. - How organisations establish process coherence in a complex supply model. - The role of a Service Management Office when establishing a shared service approach. - The transition from an IT shared services to a business shared services model. Troy is considered by many to be one of the world’s foremost ITIL and ITSM experts and is a lead architect of the brand-new ITIL 4 certification scheme. A passionate and experienced executive consultant, Troy is always willing to use his extensive background to share what he knows and is always on the hunt for more knowledge. Troy is a frequent speaker at ITSM events, is an ITIL 4 contributing author, has contributed to several books based on ITSM and Lean IT concepts, and maintains a blog that is one of the industry’s most popular and informative. What is your Total Cost of Ownership when looking at new Service Management solutions? Beware of hidden expenses. Matt Klassen, Cherwell; John Huckle, Business Forward; Ryan Mulvaney, Business Forward. Digital transformation has become a mandate, not just for IT, but across enterprise-wide business processes, including HR, finance, and facilities. The IT organisation has a unique opportunity to drive digitisation and service transformation throughout the entire organisation, overcoming traditional silos with a unified approach. Matt Klassen, VP of Product Marketing, Cherwell Software, and guests, discuss how two global brands are leading the charge with digital/service transformation. Ryan Mulvaney, Principal Consultant, Enterprise Service Management Practice, Business Forward. "Digital Transformation” is one of the most popular action items IT leaders are tasked with today. The goal is to keep pace with customer demands in order to compete in a constantly changing economy. In order to support evolving technology, ITSM has progressed from reactive to proactive, in some cases utilising pattern recognition in the form of predictive analytics (Big Data) to bypass the need for human intervention. One of North America’s most insightful and engaging ITSM and support experts, George is an ITIL® expert with more than 30 years’ experience in the IT industry and co-author of the ITIL V3 Continual Service Improvement core volume. George spent several years as a consultant to the White House on technical presentations and conferences. He also coordinated technical presentations for members of the President’s cabinet, the Smithsonian Institute and the Federal Bureau of Investigation. A regular author of IT articles and white papers and a sought-after presenter at global ITSM conferences and webinars, George’s winning personality captivates audiences, be it in print, over the airwaves or in person. Alan Sherwen, Arriva; Klemens Rauch, Brennercom; Nicos Kyriacou, LSE & Richard Burton, Utilize. Customer stories from Arriva, Brennercom, LSE and Utilize. We want you to be a part of the 2018 IT service transformation virtual event! Join us for the live event to learn how IT teams are modernizing IT service management, automating key processes across their organizations, and breaking down silos that stand in the way of progress. Can’t make the webcast? Register anyway and we will send you the on-demand recording. Enterprise service management solutions have expanded service thinking beyond IT. Vendor solutions enable organizations to broadly apply service management practices to the rest of the business, uncovering new value and improving service experiences across IT and non-IT business units. Forrester Research recently completed the first comprehensive survey covering 13 major ESM vendors. - The relationship between enterprise service management and business process management. - What we at Forrester learnt from the ESM Wave research. - The relationship between DevOps and ESM. Join Charles Betz, Principal Analyst with Forrester, for an inside look at the latest Forrester Wave: Enterprise Service Management. One thing that we are 100% sure of is that there is a not a prescriptive approach to implementing ITIL. In fact, the first lesson is...never “implement ITIL.” Each organisation is unique and must consider its individual pain points before getting started. Join George Spalding from Pink Elephant for a live discussion that includes a pragmatic approach to ITIL, ITSM, and Lean. From daily operations through to growth and change, IT is responsible for supporting your business. This puts IT at the heart of the organisation, but it also puts pressure on your IT team to achieve, whilst maintaining and integrating best practices that support agility and stability. ITIL, the most popular IT best practice framework, can provide this stable platform, whilst enabling speed and efficiency. But beware of the pitfalls – being over-ambitious, inflexible or complacent can lead to problems and poor performance. This webinar, 7 Deadly Sins of ITIL implementation, explains how you can get the best out of ITIL, whilst remaining competitive and agile. About Tracy: Tracy was the project manager for the successful ISO/IEC 20000-1:2005 certification at the Florida Department of Revenue. The first state government agency to be certified in the United States. Tracy has achieved the following certifications: ITIL Expert, PMP, Executive Consultant/Manager in ITSM according to ISO/IEC 20000, Six Sigma Green Belt, Internal Audit Certificate in ITSM according to ISO/IEC 20000-1:2011, and is a Certified Public Manager. Alan Sherwen, Director of IT Services at Arriva, talks about the company’s major IT transformation project to centralise its IT department and service desk team. The Cherwell IT Service Management platform has enabled Arriva to unlock several powerful business advantages and over 20% of requests now come through the newly created customer portal. Alan also explains how he has achieved centralised processes and united service teams, as well as very effective KPI and reporting systems. At the top of every CIO’s agenda: Digital Transformation. That’s a massive undertaking, so why not start with the essentials - ensure your ITSM tool supports today’s most modern requirements. Think of it as enterprise service management through a digital transformation lens. Join Stephen Mann as he shares 5 ways your ITSM tool must support digital transformation. 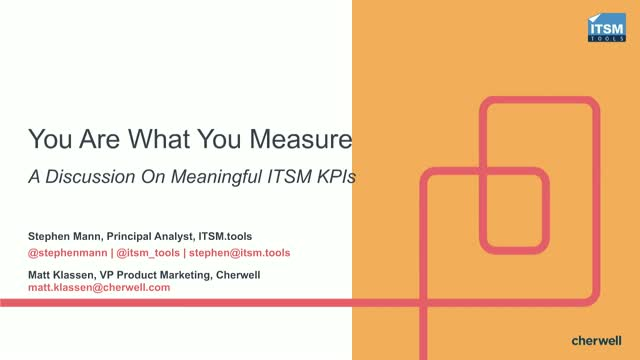 Stephen is Principal and Content Director at the ITSM-focused industry analyst firm ITSM.tools. He is also an independent IT and IT service management marketing content creator, an Associate Analyst at IT industry analyst firm Ovum, and a frequent blogger, writer, and presenter on the challenges and opportunities for IT service management professionals. Cherwell delivers IT service management, workforce and business enablement solutions that allow IT to become a true partner to the business. Built on a modern, metadata architecture, the Cherwell platform enables IT teams to rapidly build, configure or merge new ITSM or business functionality—without touching a single line of code or living in fear of the next upgrade. Because of Cherwell’s focus on delivering a solution that is easy to configure, customize, and use, IT organizations extend Cherwell to solve a wide range of IT and business problems. With an unwavering commitment to putting customers first and being easy to do business with, Cherwell enjoys 98%+ customer satisfaction rating. Learn more at www.cherwell.com.